A schedule combining meetings into a three-hour Sunday block has been introduced throughout the Church. The First Presidency announced the changes in a letter accompanying instructions for stake presidencies and bishoprics. Wards and branches throughout the United States and Canada are implementing the program March 2. Those outside the U.S. and Canada will begin May 4. The Churchwide initiation of the program follows several months of pilot studies in which selected stakes tried variations of the program﻿—with marked success. Attendance at sacrament meeting and Relief Society increased an average of 10 to 15 percent in the pilot areas. Priesthood, Young Men, Young Women, and Sunday School attendance rose 8 to 10 percent. Primary also had an increase, though slightly lower. The consolidated schedule increased Church attendance among the less active, with fewer people leaving or skipping meetings. The new schedule groups sacrament, Sunday School, Melchizedek and Aaronic Priesthood, Relief Society, Young Women, and Primary meetings into a specifically divided three-hour time block. Ten-minute breaks separate the meetings. Local leaders are being given two options of how to arrange the meetings. In the first option, called Option A, all ward members are together for sacrament meeting. The ward then separates into Sunday School classes (for those twelve and older), Primary classes (for those under twelve), and nursery (ages eighteen months to three years). While Primary and nursery children stay in sessions lasting one hour and forty minutes, those over twelve attend Sunday School classes and then regroup for quorum, Relief Society, and Young Women meetings. Consolidated Meeting Schedule, Option A. 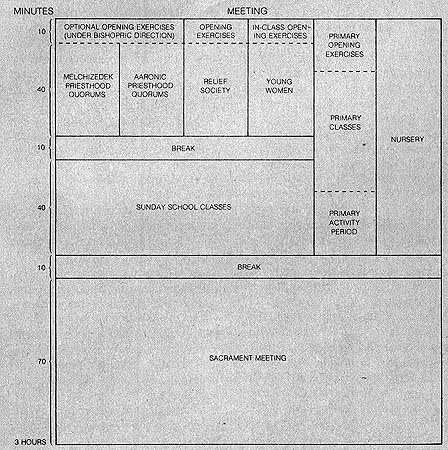 Consolidated Meeting Schedule, Option B. In the second option, Option B, ward members first meet in priesthood, Relief Society, Young Women, and Primary meetings. Sacrament meeting is held last. Under the new program Junior Sunday School is discontinued, since children are taught on Sundays in Primary. Prayer meetings for all organizations are also discontinued. Young Men and Young Women weekday Mutual activities will usually be held on a ward activity day. One day of the week other than Sunday or Monday may be designated as ward activity day, on which activities for organizations or the entire ward, as much as possible, are scheduled. The consolidated meeting schedule reemphasizes personal and family responsibility for learning, living, and teaching the gospel. It also allows Church members more time for personal gospel study, service to others, and meaningful activities. “1. Help every Latter-day Saint home become a place where family members love to be, where they can enrich their lives and find mutual love, support, appreciation, and encouragement. “2. Emphasize home-centered Sabbath activities. “3. Make more flexible a weekday activity program for all members. “4. Reduce the amount of travel by Church members and provide opportunities for family members to travel together and participate in Church activities. Home Evening. Monday night continues to be reserved for family home evening. Church buildings and facilities are closed on Monday evenings. Monday family home evenings could include family recreational activities, in addition to gospel instruction from home evening manuals, scriptures, general conference addresses, Church magazines, and other appropriate Church sources. Melchizedek Priesthood. Melchizedek Priesthood quorums meet Sundays for fifty minutes. A brief combined Aaronic and Melchizedek Priesthood opening exercise may be held at the bishop’s option. Priesthood quorums will teach priesthood leaders, especially fathers, to plan and carry out appropriate Sabbath-day family activities. Aaronic Priesthood. Aaronic Priesthood quorums meet Sundays for fifty minutes. The Aaronic Priesthood program for young men remains essentially the same as outlined in the Aaronic Priesthood Young Men Handbook, except that the positions of ward and stake sports director are now eliminated. Athletic programs for Aaronic Priesthood quorums are under the direction of the ward physical activities specialist, with supervision by the bishopric. In addition to their Sunday meetings, quorums will usually have an activity during the week. Where travel is restricted or other limitations exist, youth activities may be scheduled less frequently. Where Scouting is used as part of the activity program for Aaronic Priesthood quorums, frequency of Scouting activities should be sufficient to provide for appropriate advancement. A renewed emphasis is placed on “priesthood purposes” and on service opportunities. All combined activities for young men and young women are under the direction of the bishopric, after being planned by the bishopric youth committee as assisted by the activities committee and approved by the ward correlation council. Combined activities are held at least once a month. Relief Society will operate on a year-round schedule, instead of the eight-month schedule used in the past. Current instructional materials are to be used. All Relief Society members meet for opening exercises and then may separate by age or interest for lessons. Lessons are taught on successive weeks in this order: spiritual living (including testimonies), mother education, social relations, and cultural refinement. In months with a fifth Sunday, home management will be taught. Visiting teacher preparation meeting is held thirty minutes prior to the homemaking session. Once a year, preferably prior to the beginning of the curriculum year, an in-depth visiting teachers workshop should be held, at which messages for the year should be discussed and communication skills practiced. Relief Society socials should be held at least twice a year, including anniversary and Christmas observances or a fall social. A stake may hold a stake visiting teaching convention, seminar, or a workshop annually or as desired. Other stake Relief Society events such as a cultural arts festival, welfare fair, or women’s meeting may be held. Young Women. Young Women classes meet on Sundays for fifty minutes. Class materials come from the current regular curriculum. Generally, young women will meet in three age groups: 12–13, 14–15, and 16–17. Where there are few girls, they may all meet as one class. The Young Women presidency presides at the weekly Sunday meetings. The youth leaders conduct a ten-minute opening exercise in each class to include song, prayer, theme presentation, and announcements. Members of each class presidency should rotate conducting so they can all have opportunities for leadership experiences. In addition to the Sunday spiritual lesson, young women should have regularly scheduled activities for social and personal development. The frequency of these activities is determined by the Young Women leadership in consultation with priesthood leaders. Such activities should be planned with the help of the young women themselves and could include the New Beginnings program; standards events; Evenings for Sharing; class activities relating to personal and social development, education and career planning, homemaking skills, service, personal journals and histories, genealogy, culture, music, dance, drama, literature, sports, and crafts. Activities that are for entertainment only should be avoided. Separate Young Men and Young Women activities will usually be held on a ward activity day. Combined activities should be held on a ward activity day no more than twice a month. Sunday School. Sunday School is held weekly for forty minutes. The organization is responsible for teaching all members age twelve and older. The Sunday School worship service (opening exercises) is discontinued. The ward Sunday School organization consists of the president, two counselors, a secretary, and teachers for the authorized courses. All other officers and teachers﻿—music, inservice, Junior Sunday School, assistant secretary﻿—are released to become available for other Church service. The stake Sunday School organization remains as it has been, except for Junior Sunday School and music positions. The Sunday School presidency is to give close attention to the improvement of teaching, to administration, and to member activation. The president supervises inservice training and assumes the duties of the inservice leader. An opening and a closing prayer should be given in each class. Primary. Primary is held on Sundays for one hour and forty minutes. The program includes opening exercises, class instruction, and a group activity period. If sacrament meeting is held prior to Primary, and depending upon the availability of classrooms, it might be advisable to hold the activity period immediately after the opening exercises. If that is the case, a closing prayer should be offered by a child at the end of the class period in each class. The curriculum is a consolidation of the present Sunday School and Primary curriculum for children between three and eleven years old. The curriculum schedule and suggested outline for the activity period have been provided to priesthood leaders. The Sunday morning nursery program is directed by the Primary for children between eighteen months and three years old whose mothers attend Relief Society or teach Sunday School, Primary, or Young Women. Existing nursery program materials are used. Primary children participate in a weekday activity, which may be held quarterly or according to local circumstances and needs. This activity could be a Primary olympics, Primary fair, Christmas party, service project, or other activity. Nonmember children should be invited and encouraged to attend. Special activities such as the Daddy-Daughter party, the Miss-and-Her-Mom Party, Early-Bird Breakfast, and Priesthood Preview should continue according to current guidelines. Regular weekday activities for ten- and eleven-year-old girls and for eleven-year-old boys are not to be held more than twice a month and should not last longer than one hour. The Blazers should use their activity days for Scouting. Where affiliation with the national Scouting program is not possible, activity days can give boys opportunities to learn outdoor skills. Patrol activities should be conducted during the daytime, with the exception of two overnight camping experiences yearly for the eleven-year-old Scouts. Girls in Merrie Miss courses A and B should use activity days to learn homemaking and outdoor skills. Planning and preparation for special activities should occur on an activity day. Every ward with enough available boys will continue to sponsor a Cub Scout pack. Cub Scouting for boys ages eight through ten will continue on a neighborhood basis, with den meetings held in homes if possible. Nonmember children are invited and encouraged to attend Primary both on Sunday and on activity day. Children with special needs should be integrated into the regular Primary, while efforts are made to meet their individual needs. Instructions strongly recommend that Primary callings, including those in the nursery, be for a minimum of one year. Primary teachers and leaders should be with the children during the entire Primary period on Sundays. With the new schedule, more men will now be able to serve in Primary teaching positions. Single Adults. The Program for Single Adults (Young Adults, Young Special Interests, and Special Interests) continues according to existing guidelines. Ward, stake, and regional firesides and discussion groups are held on Sundays as travel conditions and circumstances allow. Music. Music continues to be important in Church meetings and should receive even greater emphasis in the home. Since there is no Sunday School opening exercise, music personnel who have served in ward or stake Sunday Schools are released. Ward choir rehearsals should generally not exceed one hour and may be held at times to meet local circumstances. Most Church music material now available from Church distribution centers can be used effectively in the home. Hymns and children’s songs can strengthen and support messages in family home evening lessons. Families are encouraged to sing as they work, play, and travel together. They might also enjoy creating their own songs and music. “Music can bring a spirit of beauty and peace to the home,” leaders are reminded. Activities Committee. Weekday organization activities are planned and directed by the sponsoring organization. The activities committee continues to serve as a resource. The activities committee plans and implements activities as approved by the correlation council, involving more than one organization, families, or members of all ages. They also calendar and schedule all activities under the direction of local priesthood leaders. Sports and Competitive Activities. The activities committee organizes, implements, and supervises male and female sports and competitive athletic programs, both youth and adult, under the direction of local priesthood leaders. Sports and competitive athletics are scheduled on a ward activity day whenever possible. Stake or regional events should be planned at a time to allow families as much time as possible to work or to schedule other activities. Weekday activities. A day of the week other than Sunday or Monday may be designated as ward activity day. Stake and ward priesthood leaders are responsible for planning activities in accordance with local circumstances and needs. Careful consideration should be given to limitations of travel, scheduling, and other factors that can impose hardships on members. Activities that involve entire families and all individual members should be emphasized. Athletic contests, play rehearsals, and the like should be scheduled, whenever possible, on a ward activity day. Scheduling should be approved by the bishopric through the correlation council. If more than one ward uses a building, scheduling is cleared through the agent bishop or designated scheduling official. Young Women may have weekly activities in addition to the Sunday lesson. The term Mutual applies only to special combined activities that occur on the activity day for young men and young women. Such activities may occur once or twice per month or in accordance with local needs. Mutual activities are planned by the bishopric youth committee with the assistance of the activities committee. This revises the responsibilities of this committee as described in the Young Men and Young Women handbooks. The ward Young Men-Young Women committee is discontinued. A member of the bishopric presides over all combined activities, and youth leaders may be called on to conduct. The activities committee serves as a principal resource for combined activities, and the young people themselves should be involved as much as possible in planning and carrying out these activities. All such activities are approved through the ward correlation council. Record Keeping. The existing correlated reporting forms will continue to be used, with some modifications. Reports completed by Melchizedek Priesthood and Relief Society secretaries have no changes. Explanations of minor changes in reporting for Young Men, Young Women, Primary, Sunday School, and ward and stake clerks have been sent to priesthood leaders. Officers and teachers serving in Aaronic Priesthood, Young Women, and Primary are reported as being in attendance at Melchizedek Priesthood or Relief Society meeting. Young Men, Young Women, and Primary secretaries prepare and mark officers’ and teachers’ attendance rolls in addition to class rolls. Reports of the pilot study indicate that “the Sabbath day is ‘less pressured’ and ‘more relaxed.’ Gospel-centered family activities such as family councils, family scripture study, and unpressured meal-time discussions were consistently reported.” Families have also found that they have more weekday time together. Implementation of the program has brought a reduction in travel time and expense in pilot areas. Some families report one-half to two-thirds less travel time. The Rapid City South Dakota Stake, one of the pilot stakes, estimates an annual savings of $100,000 to members because of reduced traveling. The schedule also decreases the daytime use of buildings. Thermostats are turned down for a longer period of time, and lights are used less frequently. One stake reports the release of a part-time custodian. Since a standard building comfortably accommodates several wards on the consolidated schedule, some stakes may have less need for additional buildings. The Orem Utah North Stake, a pilot stake, reports canceling plans for a new building. The schedule allows many more adult women and young women to attend weekly instruction year-round. Many had employment or other conflicts that kept them from attending weekday and evening meetings on the old schedule. An updated report on the pilot stakes shows that increased attendance, favorable attitudes, and other trends are maintaining, not declining, as pilot stakes continue on the consolidated schedule. Because the new schedule will give families time together on Sundays, parents will want to plan activities for the Sabbath that will spiritually strengthen the family. They may wish to spend some time with the family each Sunday in gospel discussion and instruction, under the direction of the head of the household. They may use the scriptures, the most recent general conference talks, family home evening manuals, Church publications, and other publications as a resource. Other appropriate Sunday activities include (1) writing personal and family journals, (2) holding family councils, (3) establishing and maintaining family organizations for the immediate and extended family, (4) personal interviews between parents and children, (5) writing to relatives and missionaries, (6) genealogy, (7) visiting relatives and those who are ill or lonely, (8) missionary work, (9) reading stories to children, and (10) singing Church hymns. Single adults will also wish to spend their time on the Sabbath day in study and in such other activities as those suggested above. Under the direction of the ward single adult committee, they may also hold firesides, give service to the sick and elderly, and participate in other appropriate Sabbath-day activities. Many activities are not appropriate on the Sabbath day, such as gardening, family parties, and household projects. Families may wish to plan family household and recreational activities for Saturday or other weekdays when parents are home with their children. “1. High priority should be given to individual and family needs and to those areas of service and activity that relate to the home. “2. Neither administrative and other meetings nor activities should prevent individuals and family members from caring for basic individual and family responsibilities. “1. 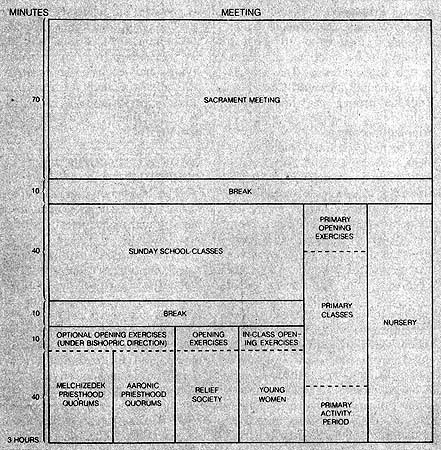 Generally, ward administrative meetings should be held at one of the following times: (a) a designated weekday, (b) on Sunday, when it would least interfere with family travel and home-centered activities, (c) during the week when it would require the least special travel and a minimum of the leaders’ time away from home. “2. A calendar of activities and meetings should be planned at least three months in advance by stake and ward correlation councils. The activities committee would prepare the activity portion of the calendar. The calendar information should be shared with each family to aid them in planning family activities. There should be a careful correlation between ward and stake meetings and activities. “3. Insofar as possible stake and ward meetings should be planned to avoid conflict with the Sunday meeting schedules in wards. Saturdays should be reserved for family activities as much as possible. “4. Administrative meetings should begin and end on time. Agendas should be prepared so that only essential matters are dealt with. “5. Where unusual distances and other special circumstances exist, consideration should be given to allow flexibility of meeting frequency so that unreasonable demands are not made upon the time and resources of the members. “Only as we see clearly the responsibilities of each individual and the role of families and the home can we properly understand that the priesthood quorums and the auxiliary organizations, even wards and stakes, exist primarily to help members live the gospel in the home. However, church programs should always support and never detract from gospel-centered family activities” (Ensign, May 1979, pp. 82–83). “We see ourselves as positioning our people so that the Latter-day Saints can give greater attention to family life, can focus more on certain simple and basic things, can render more Christian service, and can have greater effectiveness in all these things﻿—through the process of simplification, scheduling, proper priorities, and by honoring the priesthood line” (Address delivered at Regional Representatives’ Seminar, 5 Oct. 1979, in Salt Lake City). The consolidated meeting schedule has been designed to help fulfill those purposes.